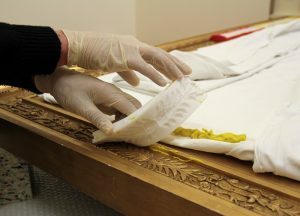 Auckland Art Gallery Toi o Tamaki completed work last year on recreating gilded decorative frames for two Victorian paintings in their collection by Lord Frederick Leighton as the original frames had been lost after c.1950. The re-created frames were modelled on an original frame in the Sarjeant Gallery Te Whare o Rehua Whanganui’s permanent collection. Conservator Detlef Klein of Manawatu Museum Services Ltd was contracted to create the two new frames. 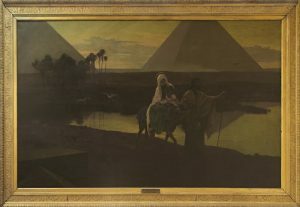 In the absence of evidence showing the original decoration, other than an indistinct black and white photograph of Lord Frederick Leighton’s A Dream from c.1950 when it was on display at Auckland Art Gallery, Klein searched for examples of similar works in other collections that could inform how the recreated frames should appear. 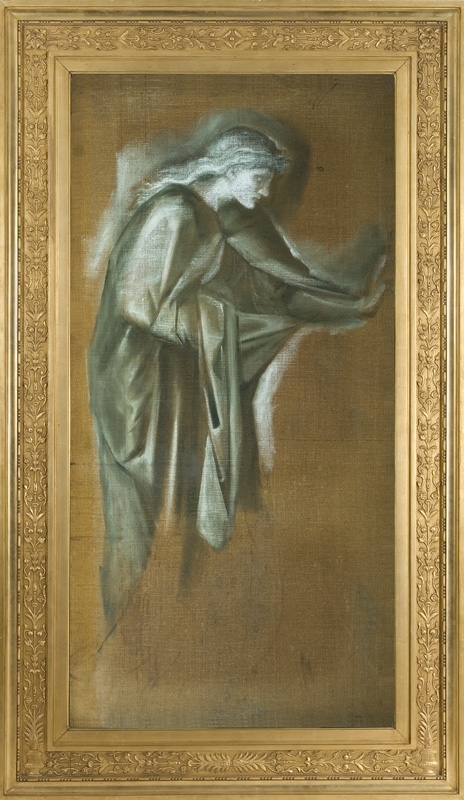 After considering a number of possibilities Thisbe, by Edward Burne-Jones from the Sarjeant Gallery collection, was considered to be the most appropriate in scale, period, and style. Thisbe, an oil on canvas painted in the 1870s, was given to the Sarjeant Gallery by Lord Leverhulme in 1924 along with five other significant works including The Fountain of Youth, also by Burne-Jones and with the same frame decoration on a larger scale, and Curiosity by Eugene von Blaas, on display at Sarjeant on the Quay in the Curiosities exhibition. Detlef Klein’s team at Manawatu Museum Services visited the Sarjeant Gallery and took detailed measurements and moulds off the Thisbe frame. Back at their conservation laboratory the team built new frames to which they applied a traditional gesso and, using a composition material made of chalk, rabbit skin glue, linseed oil and cellulose fibre, painstakingly formed and applied the intricate decorative design to the new frames. Gold leaf was then applied and the surface burnished to make the frames appear older, as if they really were from the Victorian period. The Leighton paintings are now housed in their new frames at Auckland Art Gallery. Detlef Klein will present an illustrated talk at Sarjeant on the Quay Thursday 12th November at 7.30pm about the Auckland Art Gallery project and the detailed process involved in creating gilded frames. Curator of Collections, Jennifer Taylor Moore, will also give a brief illustrated presentation about the recent move of the Sarjeant Gallery’s largest painting The Flight into Egypt which has a very distinctive ornate frame and was moved in preparation for the Gallery’s redevelopment.